Welcome to the PetQuip New Product Showcase. The opportunity to display articles on this page is an exclusive benefit of PetQuip membership. Product entries are displayed in the New Product Showcase in the date order in which they were received by PetQuip, with the latest received being the first to view. To ensure that only genuinely new items are displayed in the New Product Showcase, members confirm when submitting an entry that the product in question has not been on the market, either at home or abroad, for more than six months. Manchester-based luxury pet bedding manufacturers Scruffs® launch their new summer and winter styles of pet bedding at Interzoo® 2018. Scruffs® has enhanced its cooling collection with the introduction of Self-Cooling beds for 2018, complete with new dedicated point-of-sale display for the cooling collection. For the fashion-based products, Scruffs® has introduced two new summer ranges, the Casablanca & Florence, which boast a much brighter colour palette than similar products in the range. 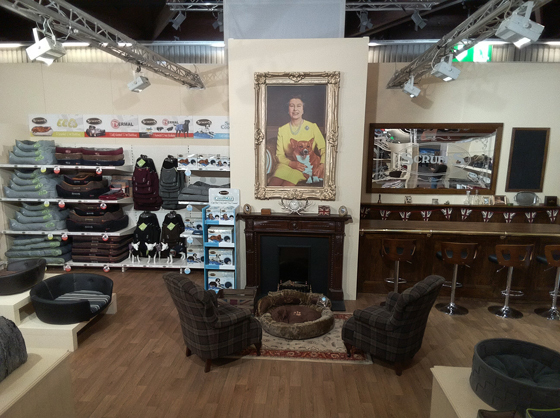 The pet-bedding company has also revealed different styles and sizes for its popular Chester, Highland & Windsor collections. Furthermore, Scruffs® has unveiled a new cat bedding collection which will be marketed under the Scruffs® main brand name later this year. This collection includes rope and felt-style beds which offer optimum comfort. Visitors to the much-loved Scruffs® ‘Country Manor’ were among the world’s firsts to view and discover the new collections, as they make their much anticipated debut in the market. Scruffs® report they met with representatives from 40 out of their 48 existing distribution markets, making it one of the most successful attendances to date at the 35th edition of the event. For more information about Scruffs® at Interzoo® or for general enquiries please contact one of the Scruffs® sales team using +44(0) 161 702 5060 or via marketing@petslovescruffs.com.